While perusing my file of past letters-to-the-editor recently, I came across one which was published in the Rockland Free Press (Maine) Oct. 8, 2009, but never submitted here, as I often do. Re-reading it, I was a bit surprised that it got published. I suspect it was mostly the humor angle that did the trick. Perhaps the editor was amused? Anyway, I offer it here that you may have a chuckle, too. As you might guess, I think Sunday schools are one of the greatest scourges ever invented for the corruption of youthful minds. This is written in response to a letter in last week’s Free Press which thanked folks for their contributions to the new Sunday school program in Camden. Now education is important, but I’m sure the leaders of this program don’t want it to turn into outright indoctrination. After all, true education teaches children how to think, not what to think.. Also, one suspects that children learn better if the lessons are about children. With those thoughts in mind, I’d like to suggest several biblical passages which might be included as units in the overall program. How about the testimony of Leviticus 27, where the fair prices to be paid for slaves are laid out? For instance, “And if it be from five years old even unto twenty years old, then thy estimation shall be of the male twenty shekels, and for the female ten shekels.” According to the complete verse, depending on their age, females are worth one-half to two-thirds as much as males. These verses then provide two valuable messages about the Bible; one is that slavery is OK according to the bible, and the second is that girls are worth about half as much as boys. Of course, the little girls in class will surely be amused by Paul’s lesson in 1 Timothy 2, “I do not permit a woman to teach or to have authority over a man; she must be silent.” Actually, the boys will probably get a bigger kick out of that one. 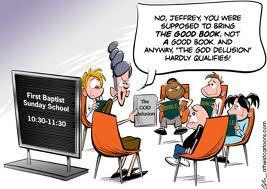 I’m sure that none of the teachers in this Sunday school are women; that would be sending absolutely the wrong message. And, since little girls grow up to be women, they certainly should learn early that giving birth is unclean, according to the bible. In the words of Leviticus 12, “If a woman conceive seed, and bear a man-child, then she shall be unclean seven days.” Of course, she is not to enter the church (“temple”) during this time. And, surely the girls will understand the need for the follow-on verse, “But if she bear a maid-child, then she shall be unclean two weeks.” That goes without saying, right? Actually, the more I think about this, the more I think that I may be wrong. Maybe we should just let children grow up a little, to a point where they have the knowledge and confidence to question the opinions of adults, before we force them to attend schools which teach only our own religious views. Why do we need to fill their trusting, curious minds with ancient myth and superstition? Why not just send them out to play on Sunday morning? I guarantee they will enjoy it more, and learn much more about how the world really works.